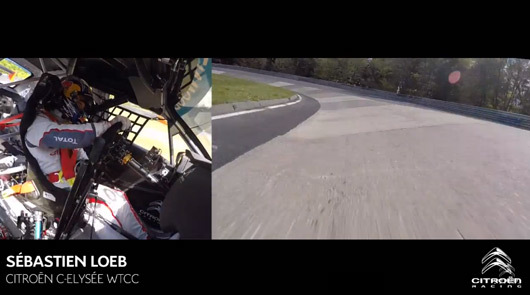 In case you missed it the WTCC crews have been to the Nordschleife and even better they will be holding a full on race meeting there as part of this weekend’s Nürburgring 24 Hour support program. With thanks to Citroën here’s a full lap of the Grand Prix track and Nordschleife with motorsport icon Sebastien Loeb at the wheel. The low angle of the camera is awesome, even if it flattens out the dramatic elevation of the Nordschleife. For what it’s worth Loeb’s Nordschleife time is a bit over seven minutes, while his best time during the official test day for the full 25+ kilometre lap, including GP track, was 8:40.517. That’s fast for a FWD racecar and within around 20 seconds of the fastest GT3 machines. It’s also worth noting that Sabine Schmitz will be racing a Chevy Cruze in the two WTCC races this weekend as well.